AAPT members-recognize the excellence of your students! Did you know that one as an AAPT member, you are eligible to participate in one of our most popular awards program? College and university department chairs, who are current AAPT members can nominate two teaching assistants, and one learning assistant for recognition as an Outstanding Teaching/Learning Assistant. AAPT will list your winners on our web page, and award a complimentary, one year membership in the Association. Chairs can download and print attractive certificates for presentation, as well as letters of recognition, and sample press releases. Any high school teacher, whose membership is up-to-date, can nominate up to three students, for the Outstanding Physics Student Award. As in the past, we will recognize your students on the web, and also provide certificates to download and print. This popular member benefit not only confers prestige on your students, but also acknowledges your contributions to excellence in the physics classroom. The awards, for both high school and college students, should be active and available in early March. Visit the AAPT web site, or e-mail us at membership@aapt.org, for the latest information and updates. Registration for the 2016 Summer Meeting in Sacramento will open in early April. The American Association of Physics Teachers (AAPT) seeks applications from and nominations of candidates for the position of Editor of the American Journal of Physics (AJP), the world’s preeminent journal in physics education focusing on the undergraduate and graduate levels. The Search Committee will begin reviewing applications on May 1, 2016 and will continue until the position is filled. The official start date will be September 1, 2017, but the new editor will ideally begin transitioning into the post no later than January 2017. Further details on the duties of the Editor, institutional arrangements, and the application procedure can be found at aapt.org. Interested candidates are also encouraged to read the recent editorial about being editor: D.P. Jackson, “Should you be editor of AJP?,” Am. J. Phys. 83, 909–910 (2015); http://dx.doi.org. Maybe you've been invited to present at AAPT. Or, perhaps you have a great idea for a contributed talk or poster or want to present in a workshop. If funding is holding you back, AAPT might be able to help. There are limited funds (awards range from $200 to $1200 with a total of $5000 for all awards) to help AAPT members attend the 2016 Summer Meeting in Sacramento to make a presentation. The application is now available. The deadline to submit is April 20th, so please submit your abstract. Please click here for more information. AAPT has small grants up to $400 available for AAPT national meeting attendees who are bringing children to a national meeting or who incur extra expenses in leaving their children at home (i.e., extra daycare or babysitting services) in order to attend a national meeting. Applications must be received by June 9, 2016 to be considered by the Child Care Grant Selection Committee for a grant associated with the 2016 Summer Meeting. Click here for more information. AAPT members can attend FEd sessions at the April meeting free! AAPT members can attend the Forum on Education sponsored sessions and plenary sessions at APS meetings at no cost. AAPT members should stop by the APS registration desk and and will be given a special registration badge. The AAPT Career Center offers FREE postings to employers recruiting seasonal interns. Locate the best fit for your organization by reaching the future of the science community - the AAPT membership, as well as the members and student members of the American Physical Society (APS Physics), AVS Science and Technology, and the Society of Physics Students and Sigma Pi Sigma. Get the word out! Your posting will also appear on the Physics Today Jobs site, which when combined with the job sites of the organizations mentioned above forms the ultimate online science, engineering, and computing career network, ensuring maximum relevant visibility for your internship. Visit jobs.aapt.org to get started. Did you know that AAPT has co-sponsored six career development webinars for its members? Visit www.aapt.org to access recorded versions of them, with topics including interviewing, networking, and how to attend a scientific conference. Check back soon for topics, dates, and registration information for our 2016 events! to introduce them to a local support network to use for mutual collaboration in and support for their implementation efforts after the workshop. We look forward to hearing from you via the following survey. AAPT is committed to increasing the effectiveness of Physics education not just in North America, but all across the world. Thanks to the Harold Q & Charlotte Mae Fuller Fund, AAPT is able to give out a number of complimentary memberships to physics teachers in developing countries. The deadline of May 31st is quickly approaching, so if you know a physics teacher in a developing country, nominate them for an AAPT membership. Have your Students Applied for a Yamani Membership? Each year, AAPT awards several two-year Hashim A. Yamani AAPT Memberships, which are regular electronic memberships and include electronic only access to copies of the American Journal of Physics, The Physics Teacher, and Physics Today. If your students are planning to become a teacher, or have just graduated and started teaching, tell them to apply for a Yamani Membership today! The 30th anniversary celebration of the U.S. Physics Team program is scheduled for May 27 - 28, 2016 in Washington D.C. A panel discussion with leaders at NASA is planned, Dr. Sylvester James Gates will be the guest speaker at the celebration dinner, as well as a number of other festivities. Click here for more information. The 2016 contest begins March 1. The contest is open to high school students in grades 9-12. Teachers register on the AAPT website and receive a confirmation code that their students can use to submit their entries (essay and photo). Photos may be entered in either the Natural photo or Contrived photo category. The top 100 entries will be displayed and judged during the 2016 Summer Meeting in Sacramento, CA. Learn more! The Frederick and Florence Bauder Endowment provides grants to support special activities in the area of physics teaching. The deadline for applications to request funds is July 1. 2016 AAPT PhysicsBowl Registration Open! Registration is now open for the 2016 AAPT PhysicsBowl taking place March 30 - April 15, 2016. Read more. 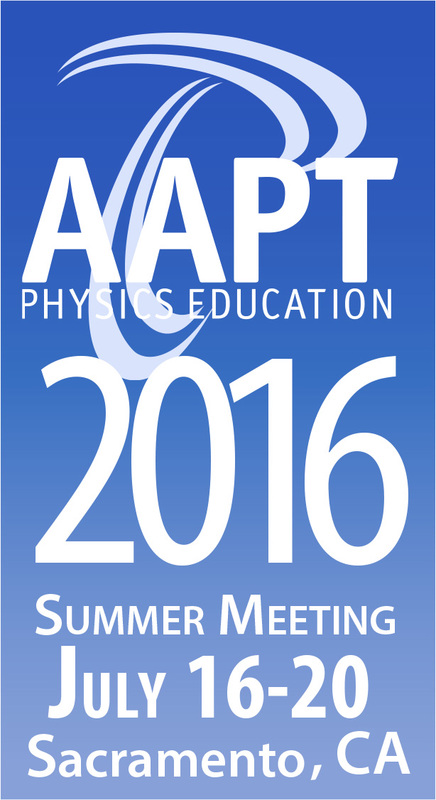 The 2016 Physics Department Chairs Conference will be held June 2-4 in College Park, MD. Please register at www.bit.ly/PhysicsChairs2016 before April 22. Getting the most from your Membership-The 2016 AAPT Calendar, and the Physics Photo Contest! 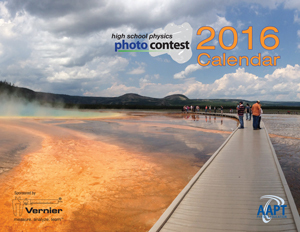 Is your 2016 AAPT Physics Photo Contest Calendar prominently displayed? Do you need more for yourself, or even a gift? Members can order up to 3 free 2016 Calendars from The Physics Store, and pay only a small mailing fee. And don’t forget to order the 2015 contest poster as well. The 2016 Photo Contest opened March 1st. As a member, you are eligible to submit up to 15 entries at no charge. Non-members must pay $5.00 for each photo submitted. This is a great way to teach your students the physics of the everyday world, as well as showcasing your accomplishments in the classroom. Discover what a speech says about you, how to prepare, how to combat anxiety, and how to show confidence and poise. Moderator Alaina Levine will coach you LIVE, face-to-face, on-camera! Speaking, articulation, and projection techniques; interaction with the audience; and presentation issues specific to scientists/engineers and for science-based conferences will be addressed. Join us for this free event, being held on April 14, 2016 at 2PM ET and co-sponsored by AAPT. To access recorded versions of career development webinars on topics such as interviewing, networking, and poster presentation, visit www.aapt.org/Resources/webinarlanding. The Physics Teacher Education Coalition (PhysTEC) is pleased to welcome 12 institutions to The 5+ Club. These institutions graduated five or more well-prepared teachers in the previous academic year. Learn more about The 5+ Club and view the recipients on the PhysTEC website. 1. Barbara Wolff-Reichert Grants will provide up to $7,500, with a 50% departmental match, toward the purchase of a TeachSpin instrument successfully mastered by a participant in an ALPhA Immersion. Read more. 2. ALPhA Mining Actualization Grants were created by the Jonathan Reichert Foundation to underwrite the construction, testing and dissemination of advanced lab experiments that are closely related to current research in physics. These are first come, first serve equipment grants with a maximum of $2,000 per school. Apply now! 3. The Jonathan Reichert Foundation announced the recipients of its inaugural grant program, supporting the advanced laboratory physics association (ALPhA) immersions. This year, the Foundation funded twelve out of sixteen applications, with a total funding of about $38,000. Congratulations to the individuals and institutions who received grants for advanced labs! Read more. The IUPAP International Conference on Women in Physics is held every three years. The next conference will be held July 16 - 20, 2017 at the University of Birmingham (U.K.). Individuals interested in being selected member of the US delegation will need to apply. Information about the application process to be a delegate will be available later this year. Visit www.uswip.org and sites.nationalacademies.org for more info. The American Association of Physics teachers is an educational organization partner for this year's Google Science Fair. Registration for the Google Science Fair is now open, and students between the ages of 13 to 18 years old from all over the world can enter! What will your students try? Find out more at www.googlesciencefair.com. The Wesleyan Argus reported that the Physics Department launched this semester’s colloquium with a presentation from Eugenia Etkina on the importance of engaging students in activities that reflect the actual practice of physics. The “Women in Physics” themed series will feature a wide variety of female speakers covering topics ranging from molecular physics to mapping Antarctica. Etkina, an AAPT member, is currently directing the physics teacher preparation program; she also works in the field of Physics Education Research at Rutgers University and co-founded Investigative Science Learning Environment (ISLE). Etkina explained that the key to success it to teach students how to think like physicists through hands-on experiments. In addition, she emphasized the importance of critical thinking for all students. Read more. Nominate outstanding K-6 science and math teachers for The Presidential Awards for Excellence in Mathematics and Science Teaching (PAEMST), the nation’s highest honors for teachers of mathematics and science (including computer science). Please consider nominating teachers using the PAEMST website today. NSF is offering free webinars from now until the end of April to help applicants complete the application process. Nominations close April 1, 2016. Applications close May 1, 2016. Presidential awardees receive a certificate signed by the President, a trip for two to Washington, D.C., to attend a series of recognition events and professional development opportunities, and a $10,000 award from NSF. The American Physical Society (APS) has established the National Mentoring Community (NMC) to provide support to African American, Hispanic American, and Native American students as they navigate the path toward earning an undergraduate degree in physics. Current physics faculty (including those at community and 2-year colleges) who are already mentoring students or are interested in doing so are encouraged to become an NMC mentor today. Learn more and register on the APS website. The Partnership for the Integration of Computation into Undergraduate Physics (PICUP) would like to invite all physics faculty to participate in one or more of the following upcoming workshops. Half-day workshops at the APS March Meeting in Baltimore (Sunday, March 13) and at the APS April Meeting in Salt Lake City ( Friday, April 15) will be held to introduce participants to the pedagogical benefits and advantages of integrating computation into undergraduate physics courses. The APS workshops are absolutely free and available to anyone, and there is no need to register. A week-long (Monday, August 1-Friday, August 5) Faculty Development Workshop will be held on the campus of the University of Wisconsin at River Falls, to facilitate participants to develop their own computational educational materials, and to formulate a plan for implementing these materials in their upcoming courses. All local expenses will be covered for participants at the River Falls Workshop, and there may be some limited funding for round-trip travel to River Falls. See www.gopicup.org for more details on these workshops and other PICUP events. The American Modeling Teachers Association has already more than 60 workshops planned for the summer. In the workshops, science teachers learn how to use the Modeling pedagogy in their content area. Workshops are offered in physics, 1st and 2nd semester, chemistry, biology, physical science for high school teachers (and others) and a separate workshop for middle school teachers, see attachment. Please go to:modelinginstruction.org/ or www.phystec.org for the complete list. Do you know any high school seniors looking to major in physics? Simpson College recently received a NSF grant that will provide 15 financially needy incoming students with financial assistance ($33,600 over four years), mentorship, and research opportunities as they pursue a degree in a mathematical STEM field. For this reason, we are recruiting talented high school seniors to come to Simpson as undergraduates. If you know any students who might be interested in this opportunity, we are more than happy to discuss more over email or phone. Contact Professor Aaron Santos at aaron.santos@simpson.edu or call at 515-961-1826. * Up to three graduate credits from the University of Oregon will be available for an additional $90/credit. For more information and to Register. What Does ORCID Have to do With Publishing Articles? ORCID is an acronym which stands for “Open Researcher and Contributor ID,” designed to uniquely identify people involved in research activities. The term is used to refer to both the identifier standard (a 16-character string) as well as the organization which creates these IDs and maintains their registry. Exploring Light: Get hands on online with the Teacher Institute! Join us online from March 24–April 27 for Exploring Light. Taught by TI staff and offered by the Exploratorium through Coursera, Exploring Light is a free professional development workshop for middle-school and high-school science teachers and general enthusiasts. Learn about visual perception, optics, image making, color, and the history of our understanding of light—by watching demonstrations of videos and exhibits and by doing fun, hands-on activities that allow you to directly experience natural phenomena using readily available materials. We’ll also explore teaching strategies and share valuable resources and tips for the classroom. We promise it will be an illuminating experience for everyone! To list your section meeting in the AAPT Calendar of Events, e-mail the information to mgardner@aapt.org. See the December 2015 Section News.